We all know that puberty is never easy. This is especially true among young teenage girls. From the second that puberty starts, girls are taught by their moms, aunts, or their female peers the importance of proper tampon usage. Girls are told of the various brands, proper usage of the applicator, and most important of all to change tampons every four hours. They are also told that there is a risk of developing toxic shock syndrome, but since the risks are so small, they often throw away the leaflet that is with the box, store a few emergency tampons in their bags, and live their lives. Like so many others, that is what model and athlete Lauren Wasser did. But unlike them, because of this she lost her leg. Lauren recounts than in October 2012, she did not feel that well, but since she was had her monthly visitor she just thought it was because of menstrual symptoms. But later that night, she was so sick that she did not even have the strength to stand properly. Her concerned mother, after not hearing even a peep from her daughter decided to phone the police to her home, where the discovered Lauren on her bedroom floor face-down. After being rushed to the hospital, it was discovered that she had a fever of 107 Fahrenheit, experienced a massive heart attack and that her internal organs were failing; she was literally minutes from death’s door. A medical specialist suspected that her tampon was the cause, and after it was sent to the lab, Toxic Shock Syndrome was confirmed. To start her recovery, Lauren was first put under a medically induced coma. After that, her stomach was flushed with fluid to remove the black toxins that was running all throughout her body. 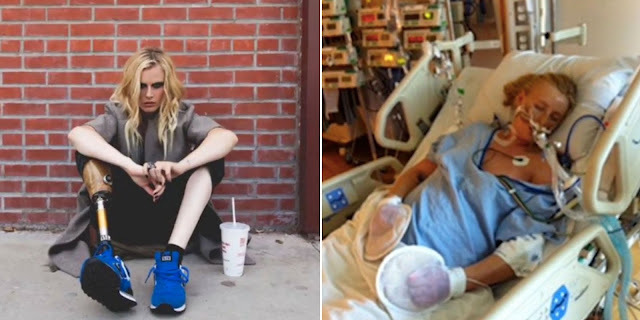 Because of gangrene, a very serious complication of toxic shock syndrome, Lauren was forced to lose her right leg (from the knee down) and the toes on her left foot. She is forced to have regular surgeries to maintain her limbs; unfortunately the chances are high that Lauren will lose her entire right leg later on. Proving that she is one tough gal, she is now an activist that aims to educate women about the dangers of TSS, even highlighting the proper use of tampons. Lauren desires to be a spark that will affect the tampon industry; she hopes that her story will inspire tampon makers to make tampons safer for women everywhere.